Mark Cavendish and fellow Omega Pharma-Quick-Step rider Iljo Keisse had to settle for second place at the Ghent Six Day event, which finished on Sunday. The 29-year-old and his Belgian team-mate were narrowly beaten to the title by Baloise Insurance duo Kenny De Ketele and Jasper De Buyst. The event came down to the madison, which De Ketele and De Buyst won to give them overall victory by 46 points. "I'm disappointed, but we were beaten by a great team," said Cavendish. "In the end I'm happy with how we did. I had the best partner and such a good friend of mine in Iljo. For me, it's an honour to ride with him." The Manxman and Keisse came into Sunday's madison trailing De Ketele and De Buyst by 52 points but attacked quickly to gain a lap. However, the Baloise pair hit back quickly to retake the lead and then had the strength to respond late on to fend off a final attack from the challengers. The winners finished on a total of 440 points, with Cavendish and Keisse amassing 394. 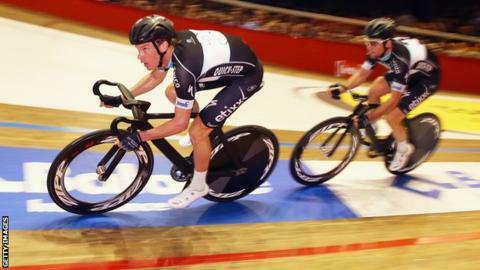 It was Cavendish's first appearance sine 2007 in the Belgium-based event, which takes place over six evenings and features a variety of events, including the madison, points and elimination races. "It took me three or four days to get into a good rhythm after not racing track for seven years," added Cavendish, who dislocated his shoulder when crashing on the road on stage one of the Tour de France in July. "We couldn't pick up the points early on, and in the end it put us on the back foot and chasing all week."